So, New Year's Eve is two days away. Very exciting, considering how long it's been since I've been able to actually enjoy a New Year's Eve without having to create and execute a special menu for a hundred people I will never meet and who are all having a great time, as one is supposed to on the last night of the year. Unemployment does have its benefits. So, this year, I turned down a private dinner job offer in order to focus on one at home. Crazy right? An unemployed guy turning down work? Well, that's how much this means to me. Mind you, this won't be a fancy 18-course meal, so sorry to disappoint the foodies out there who want to read about me making triple smoked foie gras pho and lemongrass gellee. No, this year I am making a big pot of Spaghetti and Meatballs. I think of all the big dinners I have cooked at home, and I think that a lot of the time, I take things too seriously. I need everything to be perfect, and plated beautifully; this time, I am opting to make things comfortable. I want to be able to indulge in drink and enjoy my home and my friends, so what leads to that better than a big pile of spaghetti and meatballs. I'm not even going to make homemade noodles; in a way, comforting=mom=box spaghetti. Comforting does not = flour and steam sticking to everyone while one psychopath rolls out 18 feet of pasta. I'll save that for the other 364 days. But, this time, I've got a big slab of beef from Iowa, and I plan on tracking down some good pork, I'll grind it all up and pile it in with garlic, parsley, onions, breadcrumbs, parmesan (yes, parmesan, not parmigianno). I'll keep it real, make a simple sauce with tomatoes (canned of course--it's December! ), garlic, onions, carrot, celery, red wine, you know, the usual. This will be an amazingly cheap New Year's Eve feast; the pasta cost around $2.50, the beef was a gift, the pork will cost around $3.50, the tomatoes, $3.00, and the rest of the stuff, we'll say it'll cost around $3.00. A total of $12.00 for four people. But, to use a lame chef term, it's all about perceived value sometimes, and full stomachs will always attest to that. So, we will keep this dinner celebration on the low-key side of things. I will, however, bake a couple of loaves of bread with my own sourdough starter. ANYWAY, I'll be making some bread for New Year's Eve. The bacteria I'm able to capture in my apartment do a great job, develop some nice funky flavors, and the crust on the loaf is terrific. 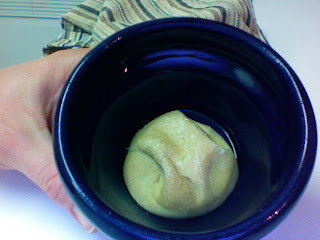 I make the starter over a 3-5 day period, starting just with about 1/4 cup of flour and enough water to make a dough; I knead it for a bit, then put it in a bowl and cover it with a wet towel. I let this roll for a couple days; it'll rise a bit, and develop a hard, dry crust (the starter's at this point in the photo below); peel this off, add about double the flour you started with, and enough more water to make the dough again. Let it develop, covered with a wet towel again, for another day or so. Refresh once more, let go about half a day and you will be ready to proceed with making bread as usual. Sure, it takes days, but that just means a bit of planning and a small amount of counter space. And this bread will cost you next to nothing--this is flour and water, and a bit of salt when you bake the bread. Cheap, and extremely good, nourishing and satisfying. Soon, I'll talk about the vinegar I'm making. It's really similar to the starter in a lot of ways, and it is delicious. Funny what happens when you give a guy a little time and a little budget. And the beans in the title of this post? That's what I ate tonight for dinner. Yes indeed. The half can of refried beans cost me about 40 cents. I steamed a bunch of broccoli I got on super sale for 29 cents a pound and drizzled it with great olive oil a friend brought me from Italy, and squeeze a bit of lemon on it. I toasted my homemade bread and spread the beans on it. A real hobo's dinner, but complete, and very filling. I drank some of my Magnum of ten dollar wine from a tumbler, and I was set. A peasant meal with peasant wine and I was happy. Probably cost just over a dollar. Good fuel for planning my meatballs and starters and New Year's Festivities. And why on earth am I hosting? Because not only do I love feeding people and having friends in my home--but guests always bring booze! Welcome to my blog. I never thought I would be writing that, and never thought I would be doing this, but I was encouraged by a friend to check it out, so that's what I'm doing. Let me explain my purpose here. I am unemployed. I have been for over a month. What is it I do while employed? Well, most recently, I was a chef. Executive Sous Chef was the title; some call it Chef de Cuisine; for those who don't understand, this is the person who runs the restaurant while the Executive Chef is not around, which is pretty much always (mind you, it's not out of laziness, usually--they just have a million things going on between multiple restaurants). I've been doing this the past 3 years or so at two different restaurants here in Chicago. Before that, I lived in Atlanta and worked as a cook, and also as a research assistant and general prep cook for a Food Network show. Before that, I was completing my culinary degree at New England Culinary Institute in Montpelier, VT. Up until then, I was using my English Degree from the University of Colorado in various jobs here and there, from Colorado to Boston to Providence, RI. So I am familiar with the job search. But it's toughest this time around, for a number of reasons, that don't really need to be gone into, other than to say that I have a pile of loans from all that schooling, and I haven't been the most responsible person credit-wise. So things are really tight right now. Tighter than they've been before. I feel like I'm back in college, but I don't have a dining hall to go to. I've found myself thinking back to when I would stretch a pack of Ramen out by cooking a couple of cups of rice and putting it in the broth once I'd eaten the noodles. But you know, I'm at a different point in my life now, and I have a different set of skills. I know how to cook now. Not that I didn't then, but I have more than a hot pot in a dorm room now. I have a normal kitchen, and some decent kitchen experience, and I am applying that to getting by, staying well fed, and eating delicious food while on limited means. And it has been an incredibly important, uplifting, and enlightening experience; after all, we all do know how to cook--we just have to find that knowledge inside us. And when we do, stretching everything in our larder becomes fun, not to mention nutritious for the body and the soul. With this blog I aim to relate to you what I've been doing, what I've been eating, and how I got there on limited means.